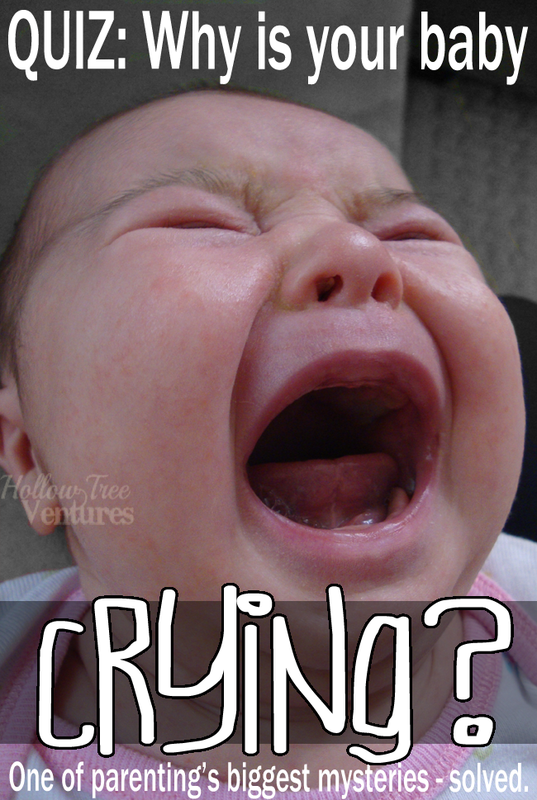 QUIZ: Why is your baby crying? I thought I'd do a little something different today! No, not shower - very funny, though. No, today I thought we'd take a helpful, informative, scientific quiz! Sort of. only a person who'd never spent time with babies would call CPS over that. One of the hardest things about parenting is figuring out why on earth your child is crying. Unfortunately I can't help you with your sobbing teens (though my guess is their crying has something to do with peers, because teens' peers are other teens, and teens are notorious for making other teens cry), but I just might be able to help you with your baby. Babies, in case you haven't noticed, cry. A LOT. But they also don't know any words yet, so it's up to you to figure out what their major malfunction is, in hopes you can make them stop crying, please, for the love of all that's holy. The nice thing about babies though, besides the way their heads smell, is that they want you to make them happy again (unlike those teens, who often prefer to sulk in their rooms). So even when you might be too close to the brink of parental insanity to notice after listening to an infant's wailing for what feels like an eternity, they are giving you subtle clues about what their everloving problem is. Now, through the magic of the internet and me figuring out how to create online quizzes (assuming this one works), you can easily figure out why your baby is crying just by answering a few simple questions. Go ahead, give it a try! I sure hope that helped, or at least distracted you from your baby screaming her face off for a few minutes. Good luck, moms and dads! Hey, that quiz site is cool, but it gave me the option to collect your email at the end as a condition of getting your quiz results. That seemed icky to me - I hate it when I get the old bait-and-switch - but that won't stop me from pointing out that you COULD sign up/follow/like me via these links below! ↓↓↓ You know, if you wanted to. NO PRESSURE.